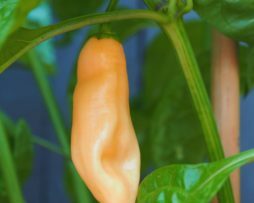 The ODA is one of the most beautiful chillies we have grown EVER…It is simply stunning with its colour transformations as it grows bigger and bigger to around 6cm x 8cms. Starting creamy white the fruit then turn a vibrant purple before ripening to a deep orange red. Plant wise the ODA is very small and compact considering the size of the peppers. 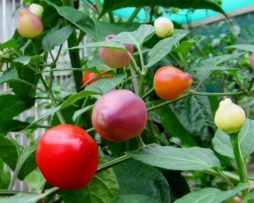 So you can even grow them in medium sized pots with the right supply of nutrients. We found it super easy to grow and the peppers got real big, real fast. The fruit are thick-fleshed and mostly cone-shaped with an amazing sweet rich flavour. No heat to this one but who cares when it looks this good. A great replacement for your usual red capsciums for a tastier salad and/or stir fry. It’s Orange and it’s apple shaped so we think that’s how this little cutie got it’s name. 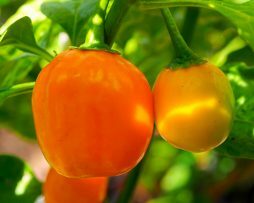 We love the perfect roundness the Habanero Orange Apple has together with its wonderful bright orange colour. Thick walled with a real crunch reminiscent of biting into a crisp summer apple. Mmmmm. Bursting with citrus fruity flavour the Orange Apple is great eaten straight from the bush or chopped over a pizza or salad. 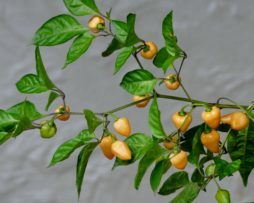 Fruit get to around 3cm wide by 3.5cm long with the plant growing like your typical chinense. With such a low heat level we reckon the kids will love this one too. Well hello! What an amazing chilli this one is. Forget the yellow or red version the Orange Brazilian Starfish is pretty close to being the best variety. 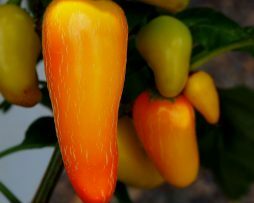 With the same flavour profile of the red and yellow we can say the orange hits new heights for freshness and sweetness. Again heat wise it is the same as a Jalapeno but the taste is more complex and fresh. With a tangerine apple flavour overall this one is simply a winner all round. Perfect in a mixed salad but even better eaten straight from the chilli plant. Pimenta Barra do Ribeiro was a great surprise for us. What a wonderful plant! It’s a great one from Brazil and is still quite rare. The way it just keeps producing is outstanding and continues to do so for many months of the year. 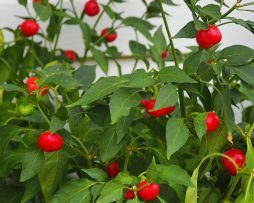 Not only is it one of the most spectacular chillies you could have in a pot, they taste excellent too! Sweet and crunchy with a little heat as well, you will find it almost impossible not to eat them straight off the bush! Don’t miss this one! Mmmm this one’s tasty with almost a sweet champagne like flavour that’s hard to describe. 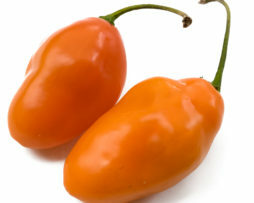 Despite its lack of heat it is a habanero type chilli that is also known as the Pimenta de Cheiro. 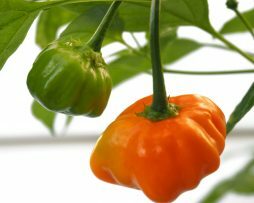 The Pimenta Luna is another great chilli for those who don’t like them too hot. Said to be originally from Brazil in South America this is a very prolific producer of 3-4cm long by 1-2cm wide fruit that have a lovely peachy cream colour. Looks and tastes great in a salad. 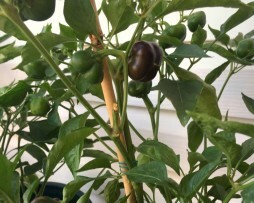 Now this…A Purple Jalapeno…how cool is that. Starting out as green this variety then transitions to a deep purple almost black before turning a fire truck red. 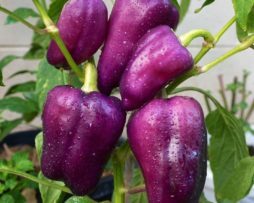 The Purple Jalapeno is a beautiful pepper hybrid that when left to mature is quite a bit hotter and sweeter than your average Jalapeno. 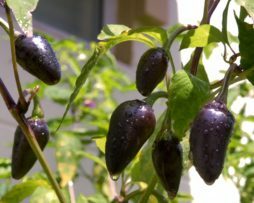 The plant has gorgeous purple flowers that add to its ornamental value in the garden and the fruit are big and plump like the usual Jalapeno. We think this variety is just begging to be pickled in all three stages of its colour transitions. This is a rare Heirloom sweet bell pepper we got from a farmer in NSW. Said to be passed down over family generations. Origin unknown. They photograph more a brown colour but have a deep purple colour when ripe. It has a lovely sweet taste that is almost grape like. 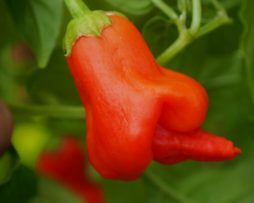 Sort of like a Bishops Crown in shape and size, the rocotillo chilli pepper is a nice mild variety that is especially sweet – One of the sweetest peppers we have tried. This one is quite rare and well worth growing for something different. It also has a very different and interesting leaf vein structure that makes it stand out in the garden. 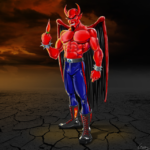 The rocotillo would be excellent in salsa or in your favorite Mexican dish.